Abstract: Christmas shopping is usually filled with two lists of things, stuff you can afford, and stuff you want. This is a list of eight products you want. Christmas shopping is usually filled with two lists of things, stuff you can afford, and stuff you want. This is a list of eight products you want, because that is just way more fun! So let the games begin and have a peek through the 8 best products directly from Japan! 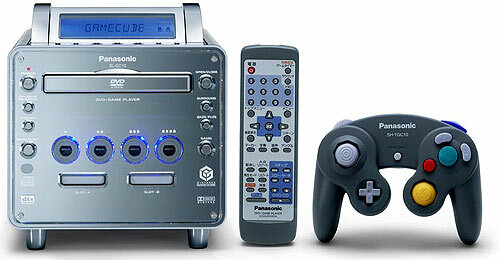 Panasonic DVD / Game PlayerThe Nintendo Game Cube may be one of the hottest Xmas gifts this year, but you can bet that this high-end variant is going turn even more heads. Dubed the "DVD/Game Player" by maker Panasonic, the unit is scheduled for release in Japan on December 14th for 39,800 Yen. The sleek little cube boast blue LED back lighting, DVD playback capabilities (not to mention CD, DVD-RW, DVD-RAM) , a full sized remote, and a host of multimedia outputs (digital AV out, L/R analog out, S-Video, optical digital out). What more could a kid want? Well component out put would be nice for starters given that this little bundle of silver joy plays DVD's - but it is without support. Personally, we'd be content to just turn on the game timer and battle it out a couple rounds, but then why not just get a little purple Game Cube? Info. Denon corporation sells the ST-50, a tiny stand alone tweeter speakers measuring just 150x180x100mm, which features a 24K gold plated Titanium diaphragm in the speaker and an aluminum die-cast body. Prices are expected to be steep for these little high end nuggets of sound which boast treble playback to 100kHz. The main body sits on a small stand that tilts to the vertical. 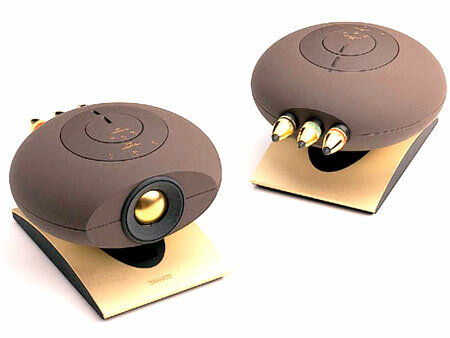 The wire connects are gold plated and each speaker has its own private ground terminal. Weight wise, the speakers a hefty 0.8Kg.Info. At first glance you would think putting in a DVD player where you car's CD-player is would be insane, worse than driving while reading a map even. But given the amount of time we all spend in bumper-to-bumper traffic jams, wouldn't it be nice to be able to sit back and flip on the Matrix until the traffic clears up? Clarion seem to think so, and the VRX825 proves it. With a stow-away LCD screen having a resolution of 1,440×234, perfect for your average DVD, this little car stereo would even make Q envious. Info. This cheery cherry sub woofer comes across more like a stool than a high-end 17Kg object of acoustic appreciation. Yamaha will begin selling the powered amplifier sub woofer YST-SW320 on December 10th for about 48,000 Yen. It comes in cherry and audio-video club black, depending on your tastes. 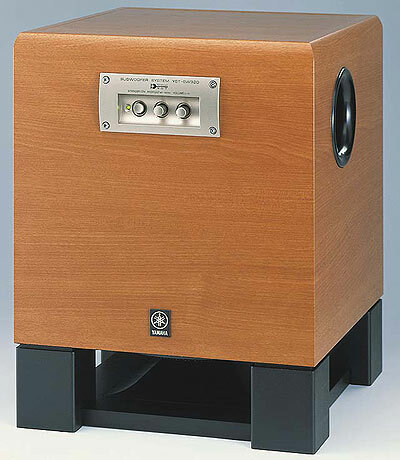 The YST-SW320 measures 34×37×43cm and features controls for a sound enhancement system known as QD-BASS. While the cherry looks real, the unit is constructed from 1" thick MDF for optimal acoustic properties. The driver is oriented downward so that "silent energy" emits to 4 horizontal directions efficiently. This according to Yamaha decreases the resonance which can occurs between a woofer and the floor. Info.